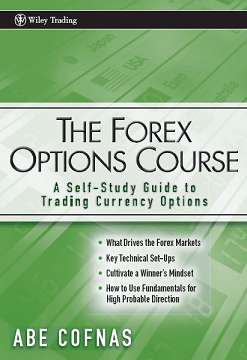 The Forex Options Course book is designed to help forex traders build upon their knowledge and skills in trading forex and apply it to forex option strategies. This book is different from the option literature that is available—a great deal on the Internet—because it places the concepts of option trading in a strict forex environment with examples to guide the reader. The book is also designed to prepare the forex trader for new option variations and intermarket choices for shaping and putting on forex options. The goal of this book is to provide a “get started” manual for understanding and trading forex options, from the basic plain vanilla calls and puts to the intriguing first generation exotic binary options.